Day 20 of the new challenge from Books and Cupcakes where we will be focusing on children’s books! 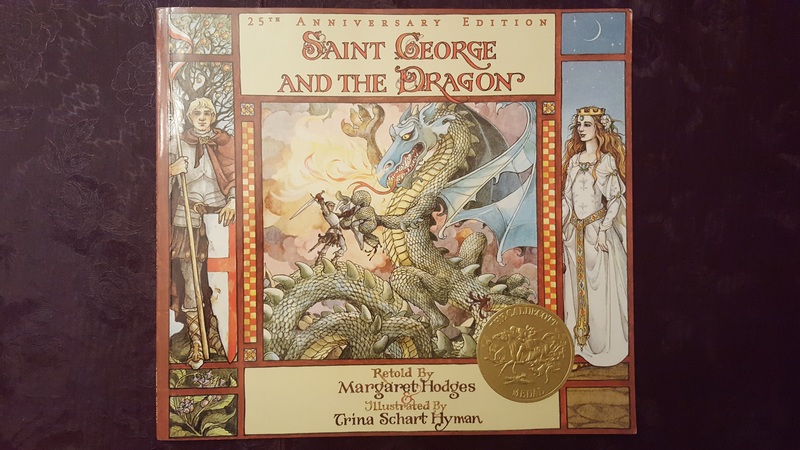 Today’s entry is one of my personal favorites, Saint George and the Dragon, by Margaret Hodges (illustrated by Trina Schart Hyman). This is the story of the Red Cross Knight’s quest to free a kingdom from a giant nefarious dragon laying waste to the land. No one has been able to withstand the dragon, but in the Red Cross Knight, it meets a foe unlike any other it has faced. An epic three day battle ensues. This a story of devotion and honor over brute strength. For the literary-minded adults in the audience, you may be interested to know that this is an adaptation of a small portion of the classic English poem The Faerie Queen, by Edmund Spenser. I have not read the larger work myself, and it is certainly not necessary to enjoy this book, but the discerning reader will definitely notice hints in some places at an overarching story.